So, a few weekends from now there will be a big deal in Salt Lake City. 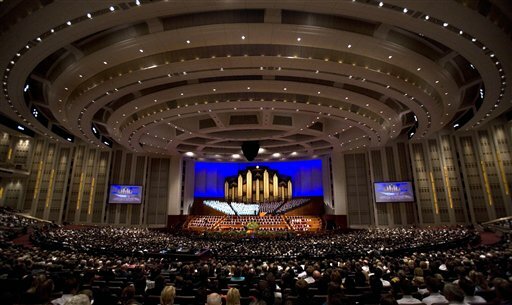 Every Spring and Fall, the LDS church (ya know, the Mormons) have their "General Conference", and people come from around the world to attend. For two weekends a year, downtown SLC is awash with white dress shirts and floral patterned dresses. And bad shoes. Always and consistently– the true hallmark of Mormonism– really bad shoes. "Is that Joel Osteen?" "Shut up." What? Huh? Oh… sorry. What was I saying? Oh yeah- I was saying that General Conference is TORTUROUSLY BORING! It's old men in dark business suits intoning the same old recycled messages year after year after year after year after year…. If you're used to Catholic or Anglican church (or the like), just imagine if the "sermon" part of the service (as opposed to the stand-up-sit-down, recite, recite, recite part of the service) lasted much, MUCH longer and was given by someone who never formally studied theology or public speaking, but just had to pick it up as they went along. So they all just mimic each other, with the effect being that there is a distinctive "General Conference" cadence. A drone that is absolutely unique to this event, and is instantly recognizable to Mormons the world over. Mormons who, sadly, are expected to watch and/or listen to this miserable broadcast semi-anually (can't we do something to help these poor people???). You may ask yourself, if G.C. is so boring, what's to keep members paying attention? If they've heard the messages before, why don't they all just glaze over and go to their happy-place for two hours? First- you should know that most Mo's will tell you that Conference is their happy place. They will say this because they get the glorious opportunity to hear their god's message through his appointed representatives here on Earth. They will tell you that Conference is a special time, because they feel "the spirit." They will tell you how much they LOVE conference. They are liars. NOBODY can love that drivel! It's awful! However… people can so muddle their own brains that they can convince themselves that they love it. When I say that the "conference lovers" are lying, I don't think they mean to purposefully deceive you or me. I mean that they are constantly and completely lying to themselves. It's fascinating. I've even tried confronting some of my hard-core Mormon friends about the lie that they love conference. The mental twists and turns that they've had to navigate to convince themselves that conference is even tolerable is far too thick a maze to ever penetrate with logic. I'll say something like "But at it's core, he's saying EXACTLY the same thing they always say, just with a different [made up] "inspirational" story to illustrate the point." Then they'll say something like "Yes, but the story was so beautiful, and it's always good to be reminded of god's love/forgiveness/laws…"
Then I'll say "Yeah, but… it was… such a long talk, and not particularly well written…"
Then, they won't say anything, because they're too absorbed in feeling sad about how I'm not going to be with them in Heaven, but I have free agency, and I make my own decisions, so I'm bringing it on myself, and why would I be trying to make them feel bad about the church, anyway, when it brings them so much happiness, but that's Satan's way of luring people away from god, and it's really sad that Satan has such a hold on me, but maybe there's a way that they can bring me back into the fold if they just can be a good enough example and show me how happy the gospel of god has made them…. Then their eyes glaze over and their mouths freeze in an awkward (and frequently Prozac-enhanced) half-smile. That's when the conversation is over. It's tricky inside a Mormon brain. Anyhoo- if you want to see this phenomenon for yourself, you can come to downtown SLC this April or October and wander among the flock. Just mind that you don't get stepped on- those shoes are DEADLY! you have to be a polygamist cause that is the structure of heaven and you have except it. no freedom to chose whether you want to be happy or not, they shove this down your throat, and in the end you have to be except be happy. the Mormons are not fit to get into power positions in the country and preach their religion to a nation in infact because they have a high sucide rate because of their abusive behaviour and high exceptations on their children if they don’t follow through, they donate to these charitys they can claim back on through tax.but If they cant look after their children they cant run a nation. and that’s when these no sucide.or abusive behaviour.they speak it with their mouths but they don’t it so they have no credibility. Boring speeches and bad shoes? Sounds like every technical convention I’ve ever encountered. So you ask your Mormon friends if they really like it, and they say yes, and you tell them there’s no way because it’s boring drivel, and they say yes they really do, and then you call them liars. I wonder why they quit talking to you? 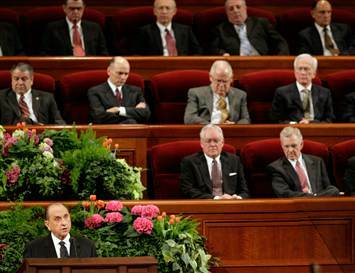 They likely stopped speaking to him because he spoke in a transparent manner and, as good Mormon shunners, they would rather ignore the obvious aspects of Mormonism’s imperfections. I couldn’t help but think of my children’s lack of interest in dentistry, (which I think is really a fascinating subject) or my own lack of excitement in my wife’s sewing passion. I wouldn’t do so well at a pipe fitter’s convention, or a Bosnian History Syposium, but it seems a bit remote for me to call the historian and the pipe fitter, or my wife for that matter a liar because they say they enjoy or benefit from something in which I have no interest. I’ve attended almost every LDS general conference for the past 30 years. 5 sessions at 2 hours a pop. Twice a year, 30 years. Not only do I attend them, I actually read and study the text afterwards. And get this. I listen to them on-line. I do understand that you may not care for them. I’m even maybe a little sympathetic that it’s not your cup of tea. (No Word of Wisdom pun intended.) It will always be that way. There will always be a division between those who believe and those who don’t. And they will both try hard to persuade the other of their position. Sometimes rudely, sometimes graciously. t’s the very nature of right and wrong. The thing about Conference is that it really does make me want to live a better life. They help me be a better neighbor, be more honest, less selfish, a better husband and father, they teach me to pray, to be kinder on the highway, to sacrifice my own interests for the benefit of others, and to give a good days labor for an honest wage. They even encourage me to pay my taxes. You know, they’re really, really well written. Good vocabulary, solid syntax, articulate delivery, interesting stories, a few jokes now and again. So what’s the problem? You’re bored? It’s true, they’re not very sensational. No gossip, no criticism, no yelling and screaming. No rock music, no cymbal crashes, no chanting during the talks. Just people listening and paying attention, trying their best to live life the best they can. So I’m not sure I get what the problem is. Do you prefer a conference that encourages you to be selfish, arrogant, dishonest and godless? Not sure what good that’s going to do any of us. Certainly won’t make community life any better. Maybe worse. Just haven’t seen a whole lot of the lying about it that you’re talking about. So if you don’t want to go to General Conference, that’s okay with me. But please don’t call me a liar because I say I enjoy it and don’t find it the least bit boring. And I do want to point out that while you may not care for a suit or a dress, I have noticed that almost everyone wears their very best shoes. OHHHHHHHH SHOTS FIRED, SHOTS FIRED!!! I like you, David. I also totally agree with your comment. I am Mormon, as well, and people make fun of us all the time, from being against gays (I am totally for gays; I could only think that many of the non-extremists in the Mormon religion would be for gays (I think the people who do push it beyond the line don’t really think about the other side of the argument (I’m not trying to stereotype all the extremists, just to let you know (I don’t think that all extremists are like that just because of the religion; I think that a lot of people are just based on opinion, probably along with our religion)))), to wearing “Magic Underwear”, as most non-Mormons would call it, gained from the special “endowment ceremony”. Dan (the author of this article), has no room to judge others, because I could say something about his religion (even if atheist), and he would say, “Uhhhh, no. That’s not right and he’s being a jerk.” He really has no room to call me a jerk in that instance, given this article is here. Even without this article, he still does not have the capacity to judge others, given he’s not perfect; nobody is perfect (except, of course, Heavenly Father and Jesus Christ). So unless you’re God or Jesus, Dan, you really never confer the right to judge others. A person can be honest, generous, and live a morally upstanding life without following a religion and listening to long, boring speeches given by elderly men. I couldnï¿½t help but think of my childrenï¿½s lack of interest in dentistry, (which I think is really a fascinating subject) or my own lack of excitement in my wifeï¿½s sewing passion. I wouldnï¿½t do so well at a pipe fitterï¿½s convention, or a Bosnian History Syposium, but it seems a bit remote for me to call the historian and the pipe fitter, or my wife for that matter a liar because they say they enjoy or benefit from something in which I have no interest. Iï¿½ve attended almost every LDS general conference for the past 30 years. 5 sessions at 2 hours a pop. Twice a year, 30 years. Not only do I attend them, I actually read and study the text afterwards. And get this. I listen to them on-line. I do understand that you may not care for them. Iï¿½m even maybe a little sympathetic that itï¿½s not your cup of tea. (No Word of Wisdom pun intended.) It will always be that way. There will always be a division between those who believe and those who donï¿½t. And they will both try hard to persuade the other of their position. Sometimes rudely, sometimes graciously. tï¿½s the very nature of right and wrong. You know, theyï¿½re really, really well written. Good vocabulary, solid syntax, articulate delivery, interesting stories, a few jokes now and again. So whatï¿½s the problem? Youï¿½re bored? Itï¿½s true, theyï¿½re not very sensational. No gossip, no criticism, no yelling and screaming. No rock music, no cymbal crashes, no chanting during the talks. Just people listening and paying attention, trying their best to live life the best they can. So Iï¿½m not sure I get what the problem is. Do you prefer a conference that encourages you to be selfish, arrogant, dishonest and godless? Not sure what good thatï¿½s going to do any of us. Certainly wonï¿½t make community life any better. Maybe worse. Just havenï¿½t seen a whole lot of the lying about it that youï¿½re talking about. So if you donï¿½t want to go to General Conference, thatï¿½s okay with me. But please donï¿½t call me a liar because I say I enjoy it and donï¿½t find it the least bit boring. And I do want to point out that while you may not care for a suit or a dress, I have noticed that almost everyone wears their very best shoes. People that defend Mormons are dumber than actual Mormons. I have to agree. I’ve never met so many deceitful, dishonest, lying, conniving, outright despicable people…as I have after moving to Utah. And all of them were “Temple Recommend Holders”. Bear in mind, there were a few who were not such. But they are definitely the minority. Mormonism is not a religion or a cult. This negates the importance of the posts.